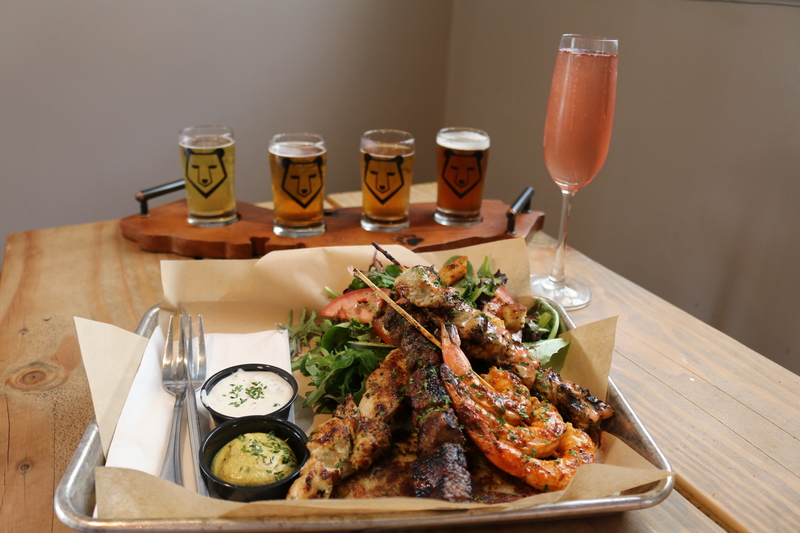 The Santa Barbara Funk Zone has become the hot spot for area brew and wine aficionados, and when Seth and Lindsay Anderson, owners of Brass Bear Brewery & Bistro, had a chance to start their new business in this hip area they grabbed it. According to Lindsay they had spent years studying the art of brew making, beginning in their Manhattan financial district apartment. They traveled to Australia and New Zealand to study what is sometimes called zymurgy – the study of fermentation, with a plan to eventually return to Santa Barbara, where Lindsey grew up, to create a tasting home for their master brews and start a family. As the plan grew so did the services, and they added good local wines for patrons to savor with a selection of food menu items. 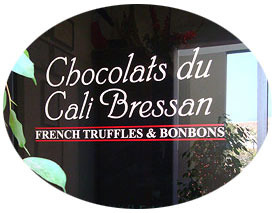 The Brass Bear is located at the right far end of the City of Santa Barbara Cabrillo & Garden Street parking lot as you enter to park, and looks like a cozy cottage at first glance. Lindsay, a design major, has made use of every inch in their venue creating a chic and space effective ambiance. 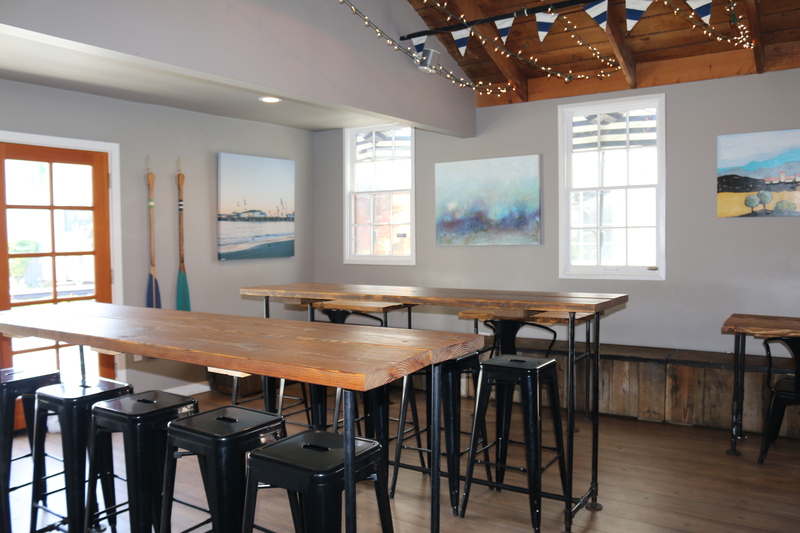 The walls are covered with paintings created by local artists, and the overall impression is clean, sleek and inviting. 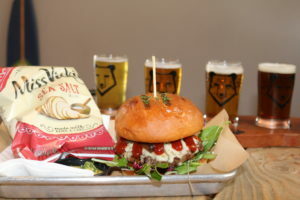 Chef Cisco Arias makes one mean and delicious burger, served with kettle cooked chips that is a perfect meal with a flight of Brass Bear Brew. His menu offers a variety of skewers made of shrimp, tri-tip and chicken as well as tico tacos to enjoy with potato cake (a recipe of Seth’s grandmother made with egg battered smashed potatoes), a green salad, bowtie pasta salad, chips or Costa Rican slaw that are all very unique. Additional menu items include grilled cheese or grilled ham & cheese sandwiches, chicken salad Sammie or a grilled veggie wrap. For the ‘ladies who lunch’ that enjoy charcuterie this is your new favorite place. Items for this amazing tray are sourced locally with C’est Cheese and include Holey Cow, Mt. Tam and Cabot Cheddar with a few divine meats from Finocchiona Salami and Niman Ranch ham to enjoy with dried apricots and delicious olive rosemary bread to dip in oil and balsamic vinegar. Their wine menu has some great local wines to enjoy with charcuterie including Hahn SLH Estate Pinot Noir, Brander Savignon Blanc and an extremely nice Piper Sonoma Rose, along additional wine menu selections. Their wonderful assortment of beer can be sampled in a tempting tasting flight of Goldilocks Blonde, Cave Age Lager, Blood Orange/Raspberry Imperial Gose and Hopping Grizzly HPA, Captain Fatty’s Rise & Grind Coffee Porter, Firestone Luponic Distorton, IPA, SLO Brewing Reggae Red, American Amber that are all wonderful and pair well with all the menu items. Soda and iced tea are available for kids and designated drivers. Matt Matlis is the main man in the bar and knows his brews as well as how to pair wines perfectly. The Brass Bear is like watching an American dream come true, and a testament to that old adage ‘plan your work and work your plan’. Lindsay and Seth have created a very special niche for the brewery set, and now have an amazing little six month old boy named William, who is adorable and loves the potato cake! I’m recommending this place to everyone and can hardly wait to go back again with friends to gossip over a charcuterie tray and a glass of Brander Savignon Blanc. Cheers! Luxottica used Let Them Eat Cake, NYC promote their new eyewear line with Burberry! Luxottica used Let Them Eat Cake to promote their new eyewear line with Burberry! Two great brands came together and made their marketing more delicious. During the event, each person got their own cookie branded with the Burberry logo. Edged with a sparkly border of sugar, they definitely stand out from the normal marketing materials that they would normally receive. Want to stand out like Burberry? Request your quote today!